CDMPS was approached by Xbox to simulate how a zombie outbreak would spread across Australian and New Zealand cities. In the event of a zombie outbreak, our research suggests that Perth would be the fastest to succumb, with nearly 100 000 people infected in the first four days. Meanwhile, residents in Darwin would be most likely to survive, with a flesh-eating disease spreading at half the speed of the west coast. Our modelling gave major cities across Australia and New Zealand a ‘Zombie Survival Index’ (ZSI) ranking, based on how well they would handle a life-altering outbreak. The safest city is Darwin, followed by Queenstown in New Zealand, Melbourne, Sydney, Perth and Auckland, which claims the title of the most dangerous city in Australia and New Zealand, should an outbreak occur. The ZSI rankings were based on a variety of criteria, including the potential rate of zombie infection, situational analysis of the infection’s origin, how the disease would spread, how residents claim they would act, and how well each city would defend themselves against the walking dead and geographical location. 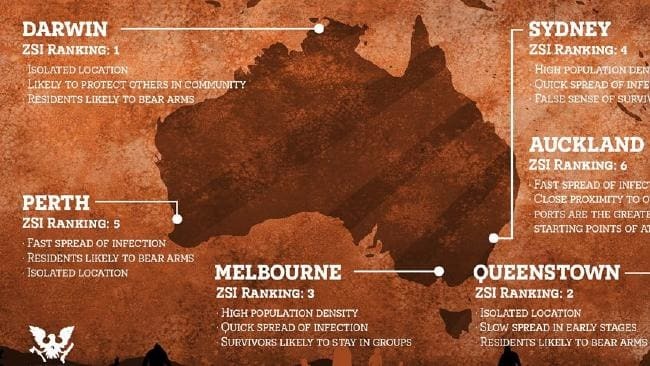 This work was commissioned by Xbox Australia to model the fictitious spread of disease throughout Australian cities to mark the launch of new video game State of Decay 2.